STABU SĒTA — 43 cozy rooms and 18 apartments, ranging from 18 to 95 m2 with a designer interior. At STABU SĒTA we value our guests and their time. We strive to provide convenience and comfort at any time of day — all services at STABU SĒTA are 24/7. At STABU SĒTA we value our guests and their time. We strive to provide convenience and comfort at any time of day. Opened daily. from 10 a.m. till 21p.m. 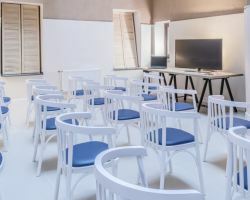 Our breakout room comfortably fits 45 people. STABU SĒTA is exquisiteness paired with simplicity, functionality and comfort. Unique tactile decor was inspired by natural materials: we balance warm wood textures and soft fabrics with touches of cool hard stone. We want our customers to feel themselves free and comfortable to stay. Opened daily from 8 a.m. till 10 a.m.
Free internet is available inside the hotel and on summer terrace. We are located at the historical part of the city and are near best shopping streets and museums. Arena Riga is the main concert and sport hall in Riga. 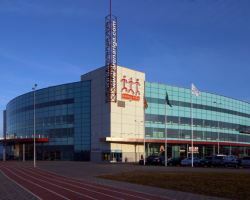 In was built especially for the World Hockey Championship 2006, which was happening in Latvia. Concerts of world-famous stars are happening here. 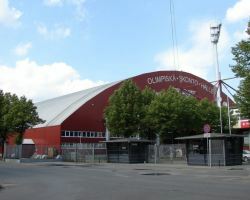 Olimpic complex Sconto is one of the biggest multicomplexes for sports competitions, exhibitions, conferences and other events holdings.